Recently Local law enforcement and fire departments held a battle of the badge event with the local Red Cross. Rita Barton Chairman of the Red Cross Leadership Council presented the trophy to Sheriff John L Hinton. Every two seconds someone needs blood. A total of 38 units was collected which can save up to 114 lives. The local Red Cross helps provide blood to 41 hospitals in Central Ohio. Red Cross appreciates every one who donated to this event and hope that you consider donating in the future. 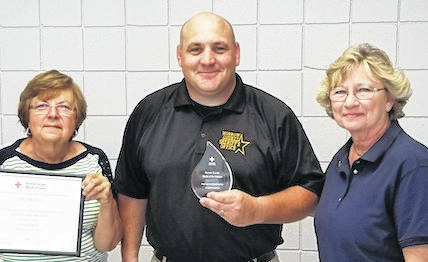 Shown are Rita Barton chairperson of the Leadership Council, Morrow County Sheriff John Hinton and Brenda Harden, Red Cross board member.